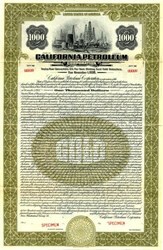 Beautiful engraved Specimen Gold Bond Certificate from the California Petroleum Corporation dated in 1926. This historic document was printed by American Bank Note Company and has an ornate border around it with a vignette of an oil field. This item is over 90 years old. 24 coupons attached on right side. 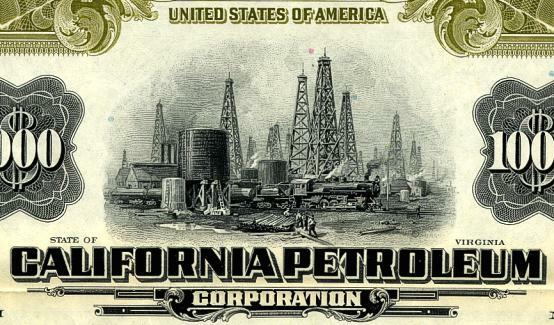 On March 2, 1928 the Texas Corporation acquired the California Petroleum Corporation, which was reorganized as The Texas Company (California). The Texas Company later changed their name to Texaco. Texaco, Incorporated, known for many years as the Texas Company, was founded in 1902 at Beaumont by oilman Joseph S. Cullinan and New York investor Arnold Schlaet. In March 1901 Cullinan, with two other promoters, incorporated the Texas Fuel Company at Beaumont. Prominent investors included the Hogg-Swayne Syndicate, John W. Gates, and the Laphams of New York. The company primarily purchased and transported oil from Beaumont's Spindletop oilfield. In April 1902 the Texas Fuel Company's major investors obtained a new charter for a corporation-to be known as the Texas Company-which authorized the company to engage in storage and transportation of mineral solutions. On May 1 the Texas Fuel Company conveyed its assets to the new company and was dissolved shortly afterward. The Texas Company was initially capitalized at $3 million and almost immediately began expanding operations. It used subsidiary companies for oil production and began acquiring barges and rail tank cars. It quickly covered new fields with leases. High production levels at two fields just outside Houston, the Sour Lake oilfield (1903) and the Humble oilfield (1905), provided the company with a secure financial base. In 1905 the Texas Company linked these two fields by pipelines to Port Arthur, ninety miles away, and built its first refinery there. That same year the company acquired an asphalt refinery at nearby Port Neches. In 1908 the company completed the ambitious venture of a pipeline from the Glenn Pool, in the Indian Territory (now Oklahoma), to its Southeast Texas refineries. Handbook of Texas Online, s.v. "," http://www.tsha.utexas.edu/handbook/online/articles/TT/dot1.html (accessed June 18, 2007).